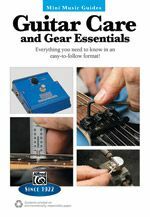 Easy-to-follow instructions on maintaining your guitar and essential information about gear!Alfred's Mini Music Guides provide essential information in a convenient size. Take these books anywhere you want to go. Packed with clear, step-by-step instructions and close-up photographs, Guitar Care and Gear Essentials is the best compact guide for guitar maintenance and gear available.Features:* For guitarists of all levels and styles* How to set action and intonation, adjust the truss rod, and maintain frets* Step-by-step instruction for proper string removal and installation on various types of guitars* Shows how to solder and maintain electronics* Detailed guide to setting up, maintaining, and troubleshooting Floyd Rose systems* Comprehensive sections on amps, cabinets, ohmage and impedance, signal flow and level, noise, cabling, and more!